VERNET proudly presents one of the best Card To Wallet methods: the Balducci/Kaps model. It is an ideal model for parlor close up and even “strolling magic” since it does not require any preparation and it is ready to be used at any time. It is made by the most experienced craftsmen in the finest leather quality. A card is selected signed and placed again in the deck. Then the magician takes out a wallet from his jacket and gives it to a spectator. When he opens he discover a zipper compartment. The magician asks him to open it and to reach himself inside. He will be amazed when he found his signed card inside. -It’s a professional item. It has the right size. 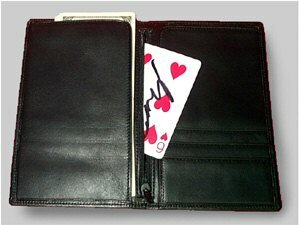 -It looks like a normal wallet not a magic prop.